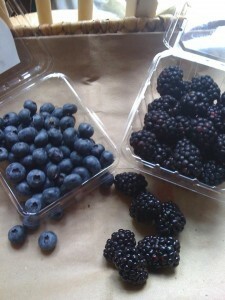 blackberries have arrived – blueberries won’t be far behind! 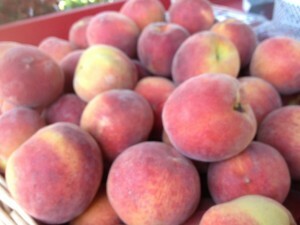 It’s early summer and the market tables at our entrance are beginning to fill up with all the colors of the season. Be sure to check out the cooler inside the greenhouse to the right – there you’ll find fresh organic eggs from Leeds, local blackberries and blueberries in season, and lady peas and other peas whenever they’re available. 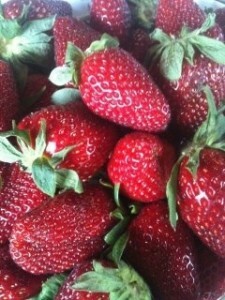 These are all big faves with our regular customers and with good reason – they are delicious! The strawberries are still coming in from Hayden; this week the first of the blackberries arrived from Jemison – and the Chilton County peaches have appeared too! We really have such an abundance of goodness, and Dená will continue to shop for the best and freshest produce through the summer months. 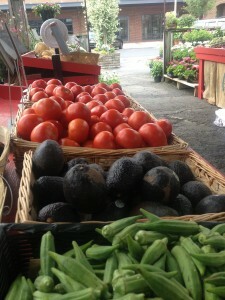 We’re really looking forward to all the local tomatoes and pretty peppers! While we do miss the admitted charm of the old space, it really was more room than we needed…and honestly a lot of folks have mentioned they like having the produce closer to the greenhouse. So, it seems to be working so far – really, it’s hard to go wrong with beautiful plants and delicious produce all in one stop, right? The shelves past the cooler to the right have an assortment of jams, jellies, pickles and honey…there really is a little of everything! Thank you to all of you who have supported our little market through these first years and all the changes its gone through…(We are still disappointed we can’t carry cheese items.) 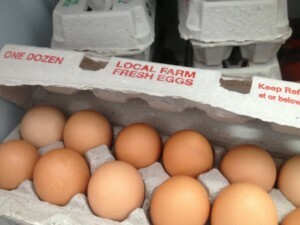 We’re so glad we can do our part to help you buy fresh and local! This entry was posted in Local Market, Seven Winds Kitchen, Vegetables and tagged fresh fruits, fresh market, local produce, market, organic eggs on June 7, 2013 by Kris Blevons.